If you have never been a part of a POLO event before, we want to invite you to join us for dinner and drinks as we kick off the fall together with a "Parent's Night Out". 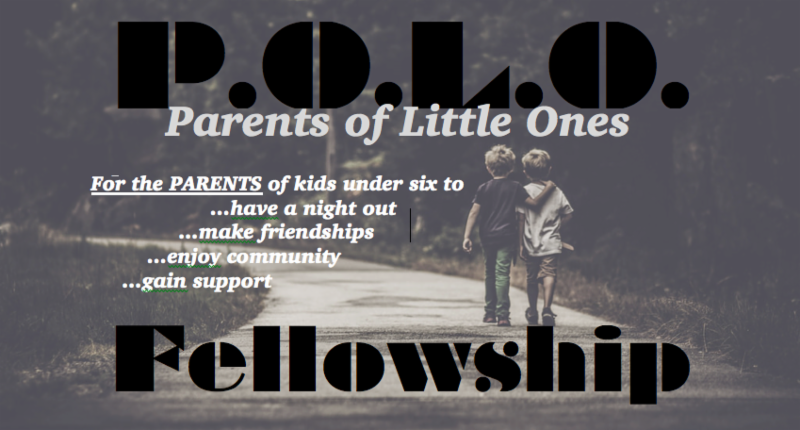 POLO is a group of parents who started getting together after realizing that all of us felt a common isolation in this unique time of life. Dinner, drinks, movies, parks, crafts, team trivia, group projects, birthday parties, this year we've discovered that it doesn't really matter what we do together. Simply having a group of friends whose lives are as ridiculous and messy as ours is a gift to us and our kids. Therefore we want to share and always be inviting others like you to join us too. Our main gathering each month, when we drop off the kids at childcare and dinner provided by SCPC and walk to dinner & drinks together at a different local restaurant each month. There is no program (religious or otherwise) to attend. The goal is simply to get to know each other better, share our stories, and build friendships in this unique time of life. During the summer months join us for ... POLO in the Park! What: A BBQ & potluck fellowship in the park with the whole family. Something for your family to grill & drink. A side dish to share. Church will provide grilling items, utensils, plates, etc. Who: Any families with a child 6 or under. Feel free to invite any parents who could use a group of friends like ours. You MUST register (forms here) before arriving. This helps us prepare child care, emergency info & dinner for the little ones. Consider the LOGOS Program if you have children over 6. Childcare is limited to children 6 and under. If you also have older children consider enrolling them in SCPC's LOGOS program, a ministry for 1st-8th grade. Please be advised, this is not a drop in program. Participation in LOGOS is expected each week, not only on POLO nights. Program info & registration paperwork can be found here. On the last Tuesday of each month all POLO men are invited to share a drink, food and some games at Champs Downtown (139 S Allen St.). Please RSVP to Mike Ozaki beforehand so reservations can be made. Who: Anyone who calls themselves dad and could use a night out. Each month the moms get together to do something, anything that seems fun. Past activities have been seeing the movie "Bad Mom", wine and snacks party, crafting at "The Makery", make up bachelorette party for 1 member of the group. No rules, just enjoying each other's company with a little creative catharsis.